When is the best time of year to find work teaching English abroad? Learn more. In many regions, ESL job markets are cyclical and hiring is seasonal. Understanding language school hiring seasons and how ESL job markets work is critical to getting hired as an English teacher in many of the largest ESL job markets around the world. In Europe and Latin America, there are two major language school hiring seasons when many teachers complete their contracts and depart, creating thousands of job vacancies for new teachers to fill. Those looking to teach in these regions should typically count on being on the ground with their TEFL Certification during these hiring seasons to interview in person. In Asia, the enormous population and emphasis on English language education has created ESL job markets exponentially larger than those in Europe and Latin America. This means that the language school hiring season runs year-round. Those looking to teach in Europe should typically count on being on the ground with their TEFL Certification during these hiring seasons to interview in person. Government assistantship programs in Spain and France require that applications be filed by March for positions beginning in September. Exceptions: Turkey, Russia and Georgia which hire year round. Summer camps hire English teachers locally and in some cases hire in advance from the U.S. and elsewhere during the winter and spring for the following summer. Many schools in Costa Rica will interview in December for positions beginning in January. Demand for English teachers in Mexico is high enough that language schools are hiring year-round. Those looking to teach English in Central America should typically count on being on the ground with their TEFL Certification during these hiring seasons to interview in person. Primary: Year-Round* Except for Taiwan & Thailand, read below for details. Demand for foreign English teachers in Asia is so high that private language schools are hiring and recruiting year around all year. English teaching jobs for private language schools in China, Japan, South Korea, Vietnam, and other Asian nations. Public schools: In countries like South Korea, public schools typically interview and recruit English teachers during the spring and early summer for August and September start dates. Some public schools will also recruit English teachers in the fall for positions that begin in January, February or March. In Japan, the Jet Program, which recruits approximately 4,000 English teachers from native English speaking countries annually requires that applications be submitted the first of December for positions beginning the following autumn (interviews will follow). The hiring season in Taiwan is after the Chinese New Year, and then again in July & August. The hiring season for teaching English in Thailand is in May and then again in November. Language School Hiring Seasons: Positions are open throughout the year. Public schools and private elementary and high schools: In Gulf countries like the U.A.E. , Qatar and Saudi Arabia and throughout the Arab World, public and private schools for children, as well as vocational schools, colleges and universities typically interview and recruit English teachers during the spring and early summer for August and September start dates. Some public schools will also recruit English teachers in the fall for positions that begin in January, February or March. In developing Arab countries like Morocco, Egypt and Jordan, some language schools hire in advance, but most jobs will be found local in-country. Most students will take a four-week onsite TEFL class immediately prior to the language school hiring season in the country where they take the class if they wish to begin working immediately afterwards. For those students taking an Online TEFL Class, the goal is to complete their class 2-3 months prior to the start of the season to provide enough time to prepare their job search and for making their travel arrangements. Onsite TEFL classes typically have a maximum of 12 students per month so classes immediately prior to the hiring season may fill up 6 months in advance. 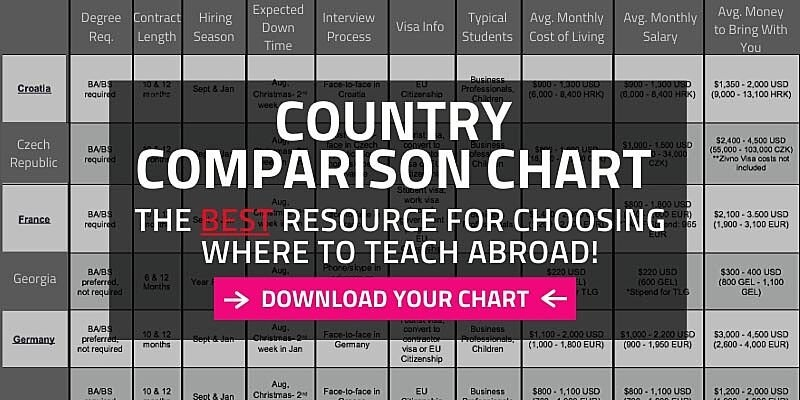 For your reference this link to our Country Chart provides basic information about working and getting hired in approximately 50 countries around the world, including information on ESL hiring seasons, salaries and the interview process.